With the sea on our doorstep and architecture that mirrors the nearby Venetian towns of Kotor and Perast, Porto Montenegro, combines a spectacular destination with a world-class marina and services. Located in the Bay of Kotor, a UNESCO World Heritage site and Europe's most southerly fjord, the marina features 245 secure berths ranging from 12 to 150 metres. 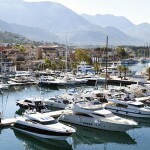 A further 245 berths are currently in development, of which more than 50 will be dedicated to yachts over 45 meters. 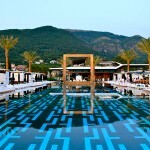 In July 2011, Porto Montenegro unveiled the PMYC Pool, a 64m infinity pool designed by cutting-edge British architect, Richard Hywel Evans. 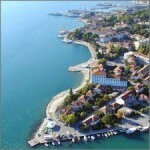 The pool and lounge bar is suspended above the sea with spectacular views of the marina and the Bay of Kotor. This season, the entire building has been re-designed by Tino Zervudachi of MHZ in Paris in a sophisticated palette of marine blues, beach whites and natural woods. The new look offers a fresh, elegant aesthetic with imported furnishings from B&B Italia, Rausch and Tuuci to ensure the upmost in comfort and style. A total of 68 day beds, 12 double-beds and 6 cabanas line the edge of the pool accommodating single guests up to groups of five. Also newly introduced this year is a food menu of poolside classics with an Italian twist, available throughout the day and served at a private dining area reserved exclusively for pool guests, alongside expertly mixed cocktails and a selection of 30 wines. PMYC Pool complex is overseen by General Manager David Saint-Andre, previously of Mortons private members club in London, with Denys Ovcharenko as Head Sommelier, ex-Novikov in London. Open every day from June to September, the pool club caters exclusively to Porto Montenegro homeowners, marina guests, Regent Hotel guests and visiting VIPs. Day memberships are available via advance application only and are strictly limited.